Anyways for September I decided to do a 40 Day Walk With Christ. I thought it would be perfect because we would end before Thanksgiving. We tend to focus on gratitude in November anyways and then we focus on the birth of Christ in December. What better way to precede these months than by becoming closer to Christ by "walking" with him? I, along with some help of two amazing ladies, put together a folder for each of the ladies that showed up to the activity. We punched holes in some of the pages and put some in sheet protectors to also include pamphlets. 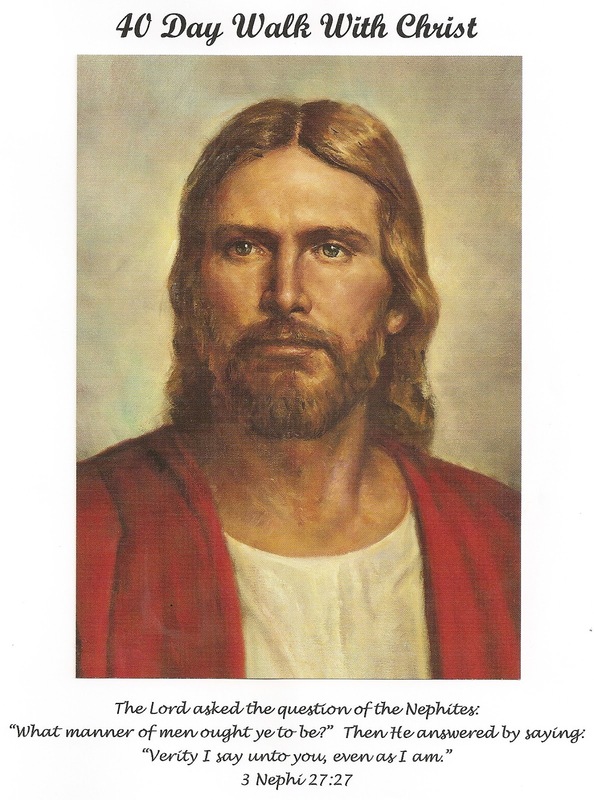 You can view all the pamphlets online at lds.org (except Pure Religion, you will have to order that one online here) As I was reading this last week I have had the quote from the second day keep popping up in my mind. I love this quote because I think this is so true in all areas of our lives. If we have a desire to be a fabulous mom, then that desire will dictate our priorities and so forth. However, if we have a desire for power then in the end our desire will lead to action. We have seen what the desire of power does to people by reading our history books. So we have to keep our desires under control. I loved this quote so much that I posted it on Facebook. I had so many people wanting a copy of it that I decided to put it on my blog. I had been contemplating posting it here anyways and with the amount of people that wanted it I made the decision this morning. I had another post planned for today, but that will come tomorrow. I do not take credit for coming up with the challenges. I got this idea from my mom's ward. However, they did not have a digital copy. They had to use white out to make changes and such (the lady from my mom's ward over the activity got the idea from her sister's ward). I decided to type it up and make the changes that I thought were good for the ladies in my ward. When I typed this up I seriously thought I was crazy half the time. It seems like with this project so many things got in my way or slowed down the process. I kept thinking to myself, "Maybe I should just do something else. Something that would be easier." Then one of my friends told me that all good things have trials that try and block the way. I knew that deep down, but hearing her say that gave me extra fuel to get past all the road blocks. This was A LOT of work. It came with a lot of tears, but it was well worth it. I can already notice a change in the way I treat my daughter, my husband, and others. An invitation was given to the apostles when Jesus Christ was on the earth to “Come Follow Me.” Through the scriptures and the Prophets, He has also extended this invitation to each of us. To begin, commit 15-20 minutes a day to “Walk with Christ”. We have prepared a simple assignment for each of the 40 days with alternate options for you to customize your journey. Please pick at least one option a day. As you participate in the assignments, prayerfully consider yourself, your family, your ward calling, and your visiting teaching sisters. Consciously commit to becoming more Christ-like as you incorporate His teachings into your life. As part of the “40-Day Walk with Christ”, commit to read the scriptures daily. Limit your TV watching and fill your homes with uplifting music. Lastly, pray morning and night and always keep a prayer in your heart. May we each grow closer to our loving Savior as we “Walk with Him” these 40 days and always. I hope you enjoy it as much as I have so far (we are only on day 6)! Thank you for sharing! This is awesome! You are so welcome Sheena! I hope you enjoy it! I love it! This is just what I needed.